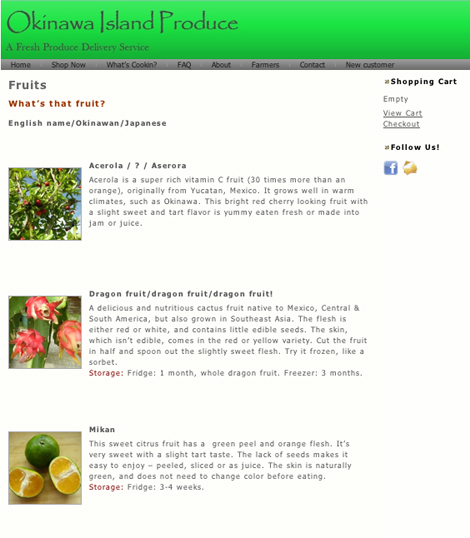 Okinawa Island Produce brings organic fruits and vegetables right to your door. The company’s founder travels around Okinawa making contacts with the local organic farmers. She takes orders for the produce through her website, and then makes home deliveries. It’s a wonderful idea. Her company supports the local farmers and provides her customers with the freshest, tastiest fruits and veggies available. We often get shikwasa, both juice and fresh fruits. They’ve largely replaced lime and lemon for a lot of our cooking and flavouring. I’ve even experimented with making Okinawa-inspired Mojito, with awamori and shikwasa instead of rum and lime.